Circus has always understood the appeal of the mechanical process. It's intrinsic to the artform at close examination, but just in the course of LIMF10 ideas in this line have taken more explicit form in The Mill (a giant, human-powered factory) and Öper Öpis (an unstable, tilting stage). Compagnie Ieto do it with benches. These are the shape of square brackets—perhaps ten foot long, able to be balanced on their ends so as to be ten foot high, and with small slot modifications that enable the construction of increasingly complex, moving structures. Early scenes where the two performers climb to stand on top of a single bench—or a T of benches with the two having worked their way to either end of the high, balanced horizontal—exert a wringing tension and grip the incredulous audience; later the designs become more intricate and four or more benches, tied with rope, are a clacking, animate tower that the performers clamber over and slide down. Technically it's either the work of very extensive trial and error or ingenious minds (or both, most likely), but the company run into problems trying to work their inventiveness into the context of a theatre show. Everything depends on the relationship between the two performers, Fnico Feldmann who plays a quiet, austere type, and Jonathan Guichard who, in a tremendous non sequitur, is either a cartoon character or a wrecked, twitching junkie, his eyes bulging and flicking between the twin distractions of the real world and the persuasive whispery appeals of his own inner monologue (rough verbalisation: a bench! I should push it! Push it! No! Yessssssss). I chose very early on to reject the idea that it was—could be—a portrayal of a mental illness, and leant toward the cartoon interpretation as the one that generated the least ethical stress. Even so it's a weird choice; some of the longueurs in setting up the benches are covered by Guichard playing at making hoop faces from the rope, and he brings the disruptive element that Ieto's stern world of balance and ordered systems needs, theatrically, but I don't think it sits as well as the company might wish, and my guess is that in developing the character they worked backward from an existing act: Guichard's tightwire. So the last build, and the last scene, is the tightwire. Except in this instance it's tightrope—building a cross base, Ieto raise two benches at 45 degrees and run rope between them, twisting it to raise the tension. The whole job takes a while, and though I don't think Ieto have fully worked out how to bring the raw appeal of large-scale architectonics into a wider theatre language, I was fairly happy watching the benches slot into place and the structure slowly emerge: in the end just some paint and props away from being part of an old SF film set, bizarre and imposing. Guichard mounts the rig, offkey sawing strings and a drunk trumpet start up, and we're treated to a spasmodic, undulant ropewalk where Guichard's character finally makes some sense—fitting the music, fitting the apparatus; it just works. It's a good end, and a last example of the company's fine skills—skills that they haven't yet found the best vehicle for. 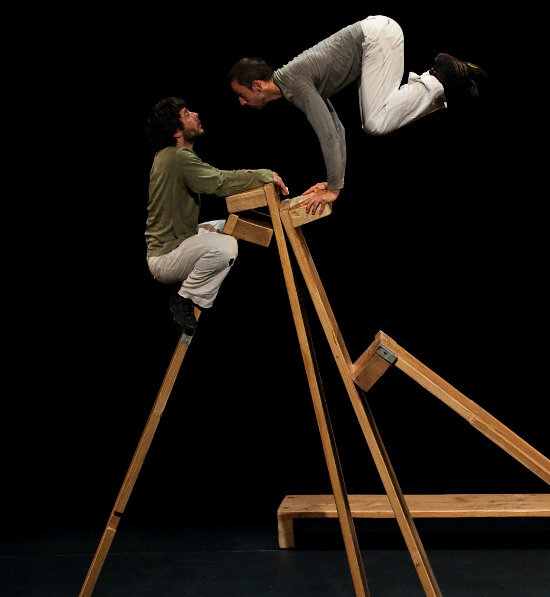 Ieto are one of the companies featured on the double-DVD compilation Le Nuancier du Cirque.